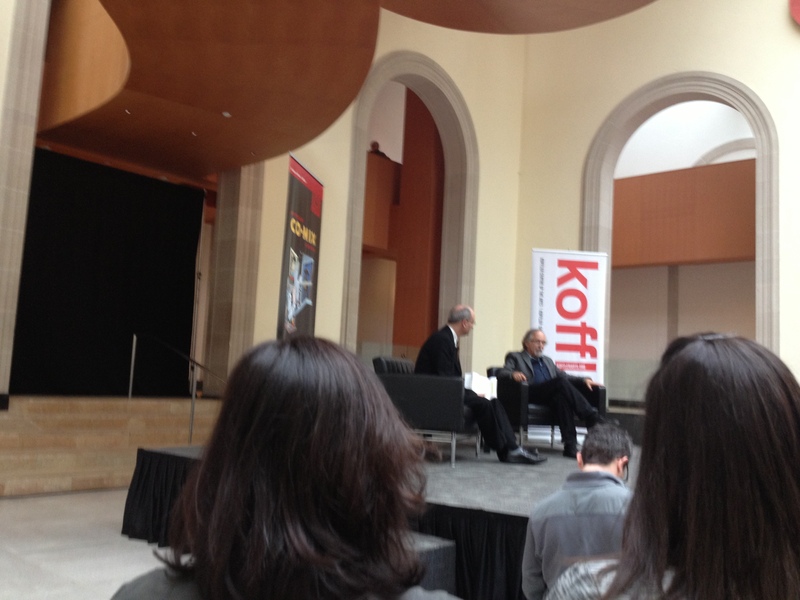 I saw Art Spiegelman interviewed at the media preview for his retrospective at the Art Gallery of Ontario. I suppose if I were like a typical critic I’d just start talking without a preamble, because (nervous cough) everyone knows his importance. Or do they? But I don’t work that way, whether I’m talking about someone famous or unknown. But how to explain Spiegelman’s influence? I suspect we’re just now ready to look at that, or maybe still too close to the time. I only know that the world has changed substantially in the last half-century, and that we’re still struggling to understand the ways in which the arts have been transformed. When I was young there was a well-defined phenomenon known as the generation gap. Boomers –those of us who came of age in the 1960s and after—experienced a profound cultural disconnect from their parents, whose values were often diametrically opposed. Spiegelman’s Maus begins for me in that disconnect, in a cultural gap between parent and child that nowadays doesn’t happen, or at least not so violently. My daughter gets the Beatles, she loves Spiegelman and Maus. We don’t have that kind of gap. Parenting is different now. Are we better parents? I don’t know, but we listen to much of the same music, look at the same movies. Spiegelman is part of that generation of transition in everything beginning with art, but reaching right into the way we understand ourselves and our relationship to the old country. It’s quite the show, five hundred works curated by the artist, making it a genuine retrospective. I’ll paraphrase a few of Spiegelman’s responses to AGO director Matthew Teitelbaum’s questions –as he played Oprah—because you recognize that he’s much more than his art. Spiegelman speaks in aphorisms, not so much because he thinks he’s Friedrich Nietzsche or Confucius, but because his comic art necessitated brief verbal gems to accompany his art. As you discover when you wander around at the show: his verbal gift is every bit as important as what he does with ink on the page, and might be the real reason for his Pulitzer. The man tells great stories, and knows how to tell them. When I first heard that Spiegelman was going to give a talk (January 26th at Bloor Hot Docs Cinema: tickets & details via kofflerarts.org) I thought to myself “nice”, but I wasn’t sure how interested I was. After listening to Spiegelman for about 5 minutes, engaging, irresistible, like a time-capsule from the counter-culture, a relic from another very magical time: I knew I have to hear him talk some more. And do I know what I am talking about? I don’t know. But the question I was tempted to ask –and dammit should have asked if I wasn’t feeling sniffly and coughing and too sick to sidle up to a microphone across the room—would have concerned Spiegelman and the druggy imagery in some of his pictures. Goya was mentioned by one polite questioner, but I suppose I am conflating the artist and the art, wondering not just about the life but also life-style. Does anyone care about drugs anymore? I merely meant, that there’s a druggy hallucinogenic quality to his art. It’s trippy, which is an amazing achievement for still images in black ink. No I didn’t ask because I suppose that, phrased the wrong way, it sounds like a moralistic accusation, when I understand it in a positive way, seeing these images as distant cousins to what de Quincey & Berlioz explored long ago. 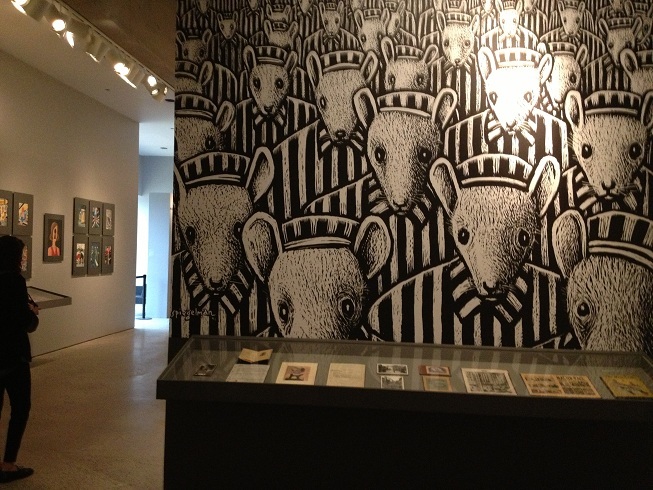 It’s ridiculous if not perverse to walk into the gallery and see Maus in its entirety on a wall. We usually encounter it in book form, not spread out on a wall: as though it were a single work of art. But that’s actually what it is. One can’t see much of it unless one were very tall AND able to bend low to take it all in. My eyes feel weak before all the details in these fabulous creations. I ‘m remembering my recent walk through the Michaelangelo show that’s still here at AGO, another tribute to the power in tiny works of art. Small isn’t just beautiful, it can be awesome & overpowering. I had to step away partway through, a bit overwhelmed by what I’d seen. Spiegelman told us that until the 1960s the comics were exclusively a commercial product, so they had to all look the same: that is, until the 60s, when comics –and everything else—changed. I am recalling the shock of those who decided to rebel, artists who decided to be different. The images had the same powerful impact of the first musicians who had long hair. I mean, it may seem like a little thing, but at the time it was overwhelming. Teitelbaum asks the inevitable provocative question: IS IT ART? 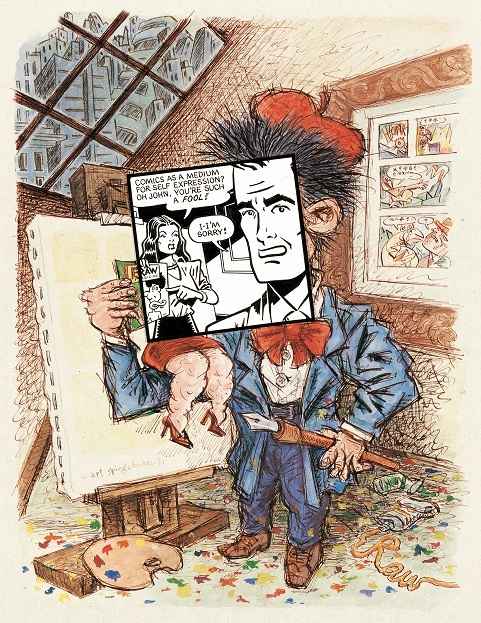 Art Spiegelman Cover for RAW no. 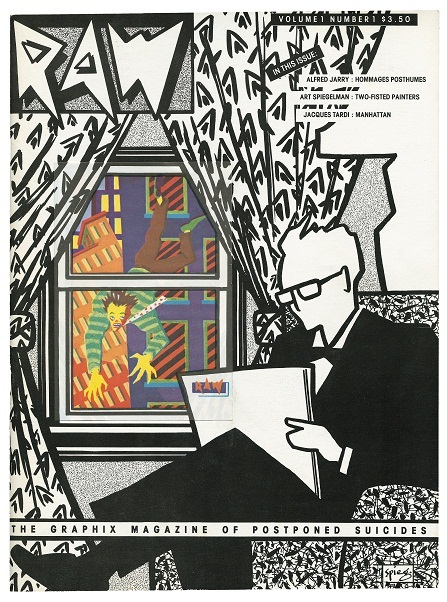 1: The Graphix Magazine of Postponed Suicides, 1980. Copyright © 1980 by Art Spiegelman. Used by permission of the artist and The Wylie Agency LLC. Courtesy Drawn + Quarterly. Spiegelman tells us that “anxiety of place” was something he experienced, as a lower middle class kid. Where do you fit in? Art and especially the criticism of art talks about high and low, good and bad. I sense that his art is addressing the cultural question –connections to the old country and the older generation (as I alluded above)—and that anxiety of place. Spiegelman is going on with a fabulous lecture that in tiny brilliant chunks explains a lot, while answering Teitelbaum’s “is it art” question. In passing he speaks of the invention of the cartoon in Montmartre (perhaps thinking of artists like Toulouse-Lautrec? ), perhaps to put us at our ease in case we’re hostile to a cartoonist in the realm of great art. Ha, if only he knew. Recently we saw shows from Ai wei wei and David Bowie, two others whose aptness for shows at the AGO might also be questioned. I’m glad that the AGO is going aggressively into this discursive space, to interrogate our assumptions, broaden the understanding of what art is. I’m reminded that maybe Teitelbaum wasn’t merely mouthing questions supplied by his knowledgeable staff, but speaking from his heart. and yes, i like where the AGO is going. Of course there was this cute moment between Teitelbaum and Spiegelman when they acknowledged that this might not be normal language for such a conversation. But the importance of that quote is to deflate the aura around the artist, to normalize his work and yes to deconstruct it. Hm I suppose seeing it as masturbation is perhaps deconstruction or possibly just a recognition that the output of these revered artists doesn’t necessarily belong on a pedestal or behind some kind of wall. This isn’t to denigrate the artist, just to put it all in perspective. Spiegelman was –if I recall correctly—trying to explain his own history, his coming to terms with art & artists. Here we are in the AGO with Alex Colville, (whose recognition as a great artist is relatively recent), and Michaelangelo + Rodin; Spiegelman most certainly belongs in their company. The fact that some would question it intrigues me, and i’m grateful for the conversational spaces such questions –especially the one posed by Teitelbaum– open for us. Musing away, Spiegelman drops a few more jewels into their dialogue. He cited Marshall McLuhan, that “when a medium is no longer a mass medium it becomes art or vanishes”. He gave the example of woodcuts. And he boggled my mind when he alluded to the old function of paintings since supplanted by photography, whereby painting lost much of its reason to exist. It never dawned on me that he was really going to talk about the fading importance of comics. But by the 1970s comics had ceased to be the popular medium it had once been. As Spiegelman put it, while they were still read widely, they’d been castrated by a comic code. And then we came to Spiegelman’s projects. As he came up to his 30th birthday he consciously decided he had to do something more significant, and as a result took on something suitably ambitious. There were two projects he envisaged. The other one fell by the wayside, but Maus grew out of his desire to do something significant and important. In 1972 “The Holocaust” wasn’t known, wasn’t the big topic it would become. People merely spoke of the war and the things that happened. It was fascinating, I should add, to hear Spiegelman give us some very personal history. “Holocaust” is one name. Even before that word acquired currency, there was another word coined, namely “genocide”, a word to describe the unimaginable, something that hadn’t been seen before. Then “holocaust” began to be the word used to describe the experience of the war, apparently a word from Elie Wiesel, which Spiegelman unpacked for us, explaining that it’s a word that means “burnt offering”. Spiegelman doesn’t approve of the word “holocaust” applied to the events of the war, nor, he added, does he approve of the epithet “graphic novel” (something mentioned only in passing). Spiegelman gave some insight into what he’s really doing when he said ”it’s easier for me to look at drawings than painting. They’re like a seismograph of how the brain works”. Indeed. As an opera fan who also listens to rock or jazz or folk music, virtuosity and the apparatus of musical expression fascinates me, especially when we come to large-scale works onstage or in the cinema. The last couple of centuries of art have seen art re-invented and reframed as something more immediate & emotionally authentic. We’ve seen it in the invention of new ways of acting onstage that strip away the alienating theatricality to let us get closer to something and someone with whom we can connect. The difference between an opera aria and a folk-song –in search of simplicity and authenticity—is very much like the difference between a painting and a drawing. Of course it’s art, but it’s not art that scares you away by being intimidating or difficult. 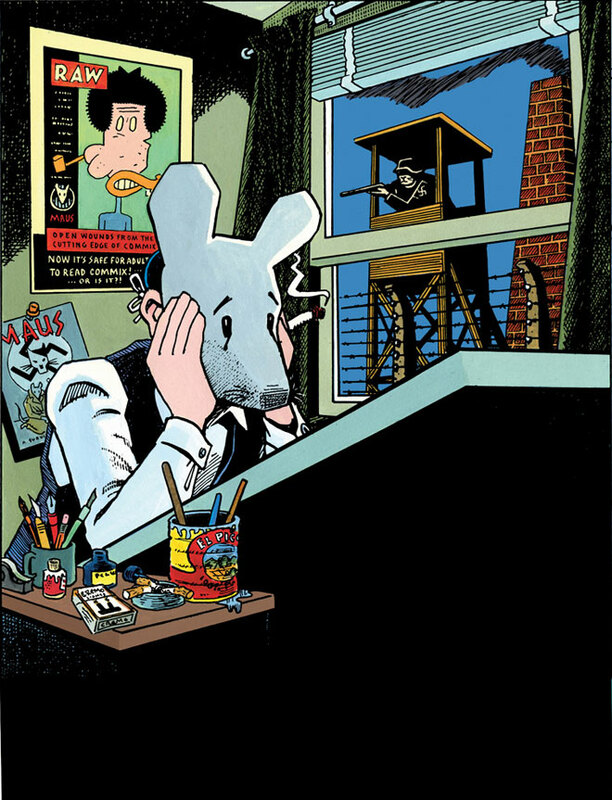 There’s a great deal to see at this show, and Maus is only part of Spiegelman’s work. If you know him and his style from the two illustrated novels, you won’t be disappointed. But there’s lots more. And there’s much more to be said. But maybe that’s best encountered either in the gallery with the art, or perhaps at Spiegelman’s January talk. I know I’ll be back for more. Art Spiegelman: What the %@&*! Happened to Comics? This entry was posted in Books & Literature, Personal ruminations & essays, Popular music & culture, Reviews and tagged Art Spiegelman, Elie Wiesel, Holocaust. Bookmark the permalink.